BHUBANESWAR-(VSK) 10th August- Shri. 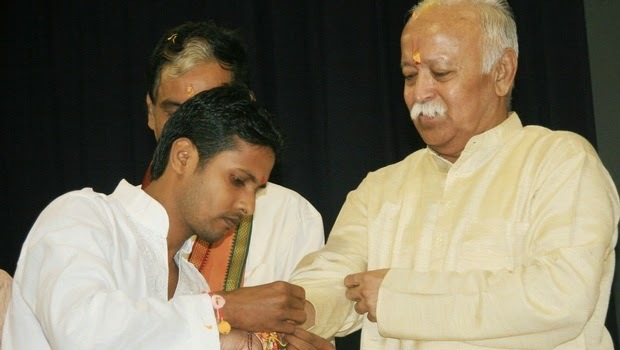 Mohan Rao Bhagwat Parama Pujaniya Sara Sanghachalak, : Rashtriya Swayamsevak Sangh addressing the function organised by Sanskruti Surakshya Samiti (SSS)at Ravindra Mandap,Bhubaneswar on Sunday said the festival of Raksha Bandhan is not just to celebrate the relationship between a brother and sister but also strengthens family values. Stating that Raksha Bandhan has national significance, celebrating the festival is one of the way to protect Hindu culture and live the values enshrined in it. The first step to progress is security. The country needs food, water, land, economic growth and above all, border security. Laxity in any of these areas will endanger national security and it is the responsibility of the people to ensure that economic development does not affect its culture as found in Western countries.About the change of government at the Centre, he said the credit goes to the people and not to any party or individual.The pople wanted a Change and they got be government they deserve. Among others, Economics Professor of Utkal University Kumarbar Das and president of Sanskruti Surakshya Samiti Sanjit Panda also spoke. Cuttack,(VSK)-10th August- "The magnanimity of the deed is not important, the intention (Bhavna) behind the deed is important. Therefore the circulation figure of the Rashtradeep is not very much important for us. As the aim and objective of the weekly is to serve the people, connect them with their root and Culture,(i.e. Hindutwa) and to help them to eradicate the suffering, pain through information and views, it will go on it's path with the very aim and objective in the years to come. " P.P. Sarasanghachalak of RSS Mananiya Mohan Rao Bhagvatji said this while addressing the valedictory of Golden Jubilee celebration of Odia Weekly Rashtradeep. The grand function was held today evening at Saheed Bhavan, Cuttack. Further he said, if we go on doing the right things continuously with a noble aim, it will definitely bring change. He added, yes, it is difficult for good to counter evil, but ultimately the good prevails, Truth and Dharma wins. Mohanji said, "all live here in Hindusthan is Hindu. Our worshiping style may be different, even some may not worship at all, we may talk in different languages, may stay at various part of the land, we may eat different food, but we are One, one Nation. We are Hindu. Those who stays in England are English, all those are in Germany are German, all those who are in USA are Americans, Likewise All here in HINDUSTHAN are HINDUs, so simple to understand. Hinduism is our Nationality. It's a way of life. Unnecessarily some are confusing people." Mohanji said even today's research revealed since 40,000 years or even much before that on the Indo-Iranian plate there living one species. DNA mapping confirms this.